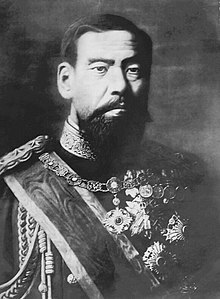 Emperor Meiji (明治天皇, Meiji-tennō, 3 November 1852 – 30 July 1912), or Meiji the Great (明治大帝, Meiji-taitei), wis the 122nt emperor o Japan accordin tae the tradeetional order o succession, reignin frae 3 Februar 1867 till his daith. He presided ower a time o rapid chynge in Japan, as the naition rose frae feudal state tae warld pouer. His personal name wis Mutsuhito (睦仁), an awtho ootside o Japan he is whiles cried bi this name, in Japan deceased emperors are referred tae anly bi thair posthumous names. At the time o his birth in 1852, Japan wis an isolated, pre-industrial, feudal kintra dominatit bi the Tokugawa Shogunate an the daimyo, who ruled ower the kintra's mair nor 250 decentralized domains. Bi the time o his daith in 1912, Japan haed unnergone a poleetical, social, an industrial revolution at home (See Meiji Restoration) an emerged as ane o the great pouers on the warld stage. A detailed accoont o the state funeral in the New York Times concludit wi an observation: "The contrast atween that which precedit the funeral caur an that which followe it wis strikin indeed. Afore it went auld Japan; efter it came new Japan." ↑ http://query.nytimes.com/mem/archive-free/pdf?res=9D05E3DB1F3CE633A25750C1A9669D946396D6CF "The Funeral Ceremonies of Meiji Tenno" reprinted from the Japan Advertiser [Article 8—No Title],] New York Times. 13 October 1912.